Lester embodies the power of music, how music can more than compensate for the lack of material things, how music infuses a kind of civility that draws people. The passing of Lester McCumbers only reveals how much people can impress their person, their spirit on a culture or more precisely on what we call life. So many of us work, volunteer, try to do good, but only a few are blessed with a brilliance or a special presence that adds a singular warmth, like a fireplace fire to an otherwise chilled room. Lester McCumbers was one of those kinds of people. I only met him once, but it was a privileged afternoon where he sat with Dave Bing, on guitar, Kim Johnson on banjo and played for all he was worth. His family, including grandkids and great grand kids were on hand. 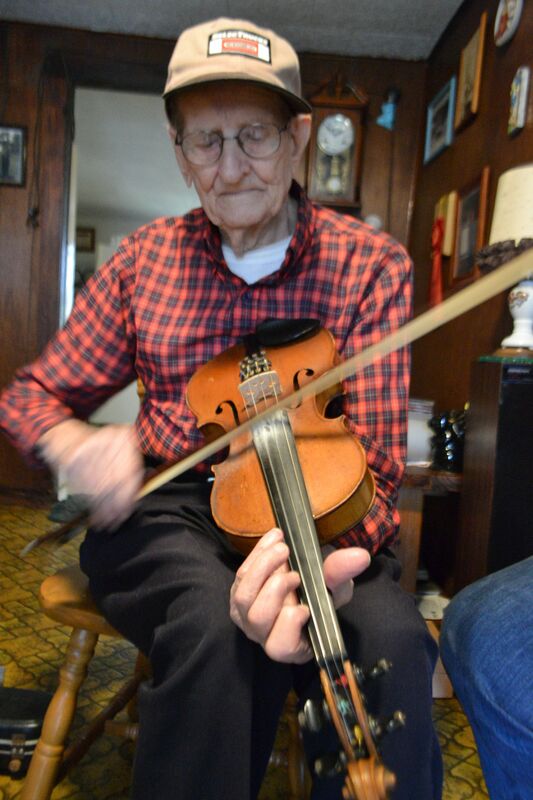 His oldest daughter was in her 70s as McCumbers then 92 with friends on both sides sat in cushioned kitchen chairs in the middle of the living room to work his repertoire. Dave Bing described him as the last of the truly old timers, “who ,”wasn’t homogenized” That is, he didn’t pull from records or popular culture or from other fiddlers. He played in a squeaky way that was full of bounce and life. At times the tunes were hard to come by. It was like watching a beautiful old car clicking away until that engine fired up strong and away they’d go. “I can play Old Jimmy Johnson, awe right,” he yelled. “Well let’s go,” answered Kim. It’s tempting to get nostalgic about the old days. Wasn’t the same bemoaning unleashed in the 1950s when those old fiddlers that hailed from the 19th century faded? But we all know the difference between McCumber’s more or less the World War II generation and the digital confusion of today is profound. Dave Bing often notes the conundrum between teaching people in the classroom, people with entire cannon of old time a keystroke away and going out to hillside to sit with someone and learn a tune. For better or for worse there’s no isolated musicians to be discovered and thus regional cultures have long melded thanks to the internet. Up and comers can learn tunes directly from online archives without ever visiting the area form which they came. That concept prompted at least one of Dave’s students to caution that musically we live in a dangerous time, where the context could get lost. This all seemed like a lot of BS until I found myself sitting before Lester and the history opened up as real as his house full of nature decor and fiddle contest ribbons. On a bed lay about five fiddles mixed with an oxygen tank and a Jesus figurine. Afterwards he showed me a fiddle he made from the floorboards of his kitchen, a fiddle bridge he made from an old apple tree out back. Lester used to work in a tiny wood mill close by and he told a story of how the blade once unhinged itself and flew between he and his fellow worker, inches from cutting one of them in half He talked about the first time he ever used a power saw to chop a tree down and fretted a bit about streams being contaminated by coal runoff.He was a bit of a joker for sure. In his bathroom on an open and neat glass shelf stood a bright yellow box of Minees sandwich cookies. But when you took a peak inside expecting moon pies you were greeted by a selection of depositories. He couldn’t wait to show me a violin that he found that he said had a Strad label on it. I thought he was putting me on until I learned later that Stradivarius also released commercial violins. Still Lester had me stuttering a bit as I wondered which one he modified, the one for the masses or the one worth masses amounts of money.